David Laurence Friedman, known by many as Mott Green, was not new to Grenada when he decided to move permanently to the island. As a boy, Mott was a frequent visitor to Grenada as his father, the director of medical services at Coney Island Hospital in New York, taught on the island each winter, often bringing his family along. Visionary, anarchist, idealist, environmentalist. Many appellatives have been given to Mott Green throughout the years, but his actions spoke louder than any nickname he could ever receive. 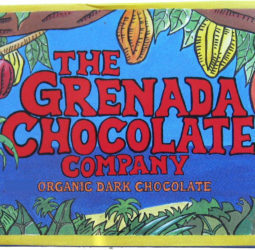 In 1999, together with Doug Browne and Edmond Brown, he founded the first chocolate making company in a cocoa-producing country: The Grenada Chocolate Company. He realized that cocoa farmers could increase their income by processing the same cocoa beans they were growing. 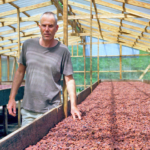 Instead of giving their flavorful cacao away to the Grenada Cocoa Association for a fixed price, they could make chocolate (or semi-processed cocoa products) and increase the value of their beans. This revolutionary mindset wasn’t received well by the Grenada Cocoa Association, and Mott was opposed in many ways. He had to fight to get a license to start making chocolate, but eventually managed to open the factory in Saint Patrick’s and start producing the first chocolate made in Grenada with Grenadian cacao. It was the beginning of the tree-to-bar movement in Grenada.